Samsung's concave phone is very much real, and after being teased in leaks hours earlier, SK Telecom has announced it'll launch the Galaxy Round on its network as soon as tomorrow. The device's highlight is obviously the gently curved 1080p 5.7-inch OLED screen, and Samsung is also promising a melee of software tweaks for the smartphone, aimed at making the most of it. For example, tilting the phone to the side will offer up notifications, battery levels and more at a glance. 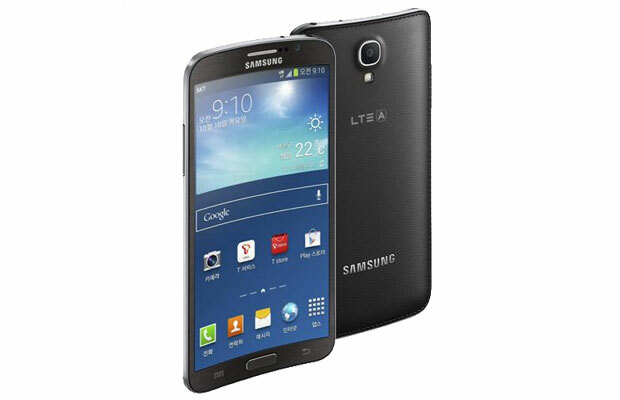 Other specifications revealed so far include a 7.9mm profile and that it weighs less than the Note 3, at 154g. Curiously, it looks pretty different to the curved-screen prototype smartphone that Samsung displayed at CES earlier this year -- if the Galaxy Round is facing down, there's no way to peek at notifications without flipping it over. The new phone will also pack the necessary LTE radios and a 2,800mAh battery, launching initially in a 'luxury brown' color option for just over 1 million won -- that's around $1,000. We've got the official press shot and a roll notification demo video after the break. Seoul, Korea - October 9, 2013 - Samsung Electronics Co., Ltd. today introduced GALAXY ROUND, the world's first curved display smartphone. Samsung has been a mobile display innovator by introducing color TFT-LCD, AMOLED, and Super AMOLED flexible display for its mobile product. With this pioneering curved display technology, GALAXY ROUND blends the latest smartphone screen innovations with unique design features. The sleek and thin Samsung GALAXY ROUND which equipped with a 5.7" Full HD Super AMOLED with 7.9mm thick and weighs 154g offers a comfortable hand grip feeling to user, and exclusive experiences of curved display. As a result of its unique curved design, users can take advantage of round integration experiences like the Roll Effect that enables user to check information such as date, time, missed call and battery easily when home screen is off, and the Gravity Effect for creating visual interaction with the screen by tilting the device. For music, the Bounce UX enables users to control their music. When the GALAXY ROUND's display is off while the music player is running, a short press to the left of the device will play the previous track while a short press to the right will play the next track. For pictures and videos, the Side Mirror feature enables users to gain access to list of the album content with a left and right tilt. The large screen size of the GALAXY ROUND provides additional benefits to users. Useful One-Hand Operation features bring a user's most desired controls closer to a preferred side of the screen. The device enables enhanced multitasking capabilities that allow users to fully utilize the larger screen through Multi Window, a feature that enables users to open more than one application on the screen, run simultaneous multiple instances of the same application or to easily share content between applications.